DJzone DJ Magazine :: Robe CitySkape Xtremes Rock the Rock! Robe CitySkape Xtreme and CitySource 96 LED wash lights were used to illuminate the picturesque and iconic Hanging Rock, a rare volcanic formation located near the townships of Woodend & Mount Macedon in Victoria, Australia, making an already beautiful natural environmental feature into an extra special backdrop to a concert by legendary singer-songwriter, musician and poet, Leonard Cohen. 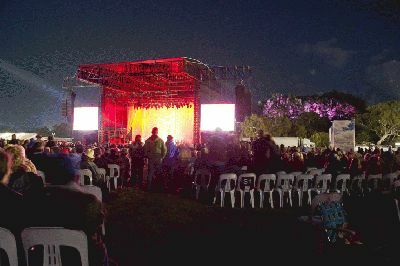 Lighting for the concert – which took place on an open air stage in front of the rock face - was supplied by Melbourne & Sydney based Frontier Touring, who proposed that the rock itself became an atmospheric element of the performance as part of the event's integral lighting scheme. For this, they needed a high powered lightsource requiring minimal power and with low environmental impact on the surrounding flora and fauna. They decided that the CitySkape Xtreme met all the criteria after a demo and coming highly recommended for the job by Robe’s Australian distributor, ULA. The 6 CitySkape Xtremes were positioned in the bushland behind the stage approximately 50 metres apart, with the longest throw distance being another 105 metres to the rocks. Rigging the fixtures in place was a real challenge itself due to the terrain and limited vehicular access. Frontier Touring also had to satisfy all the relevant authorities – including the Parks and Fire Departments – that using the fixtures to illuminate the rocks was safe and practical – all of which was deemed to be ‘low risk’ after detailed inspections. The CitySkape is one of the most powerful LED wash lights currently available on the market, with 188 LEDs and an output equivalent to a 650W incandescent source, however the power consumption and heat emissions are minimal for the sheer amount of light exuded. The smaller Robe CitySource 96 units were chosen for a specific section of the rock lighting scheme, and to further limit the (generator supplied) power needed. These were fitted with barn doors for precise shuttering, and matched to the same colour mixes as the Xtremes. The Xtremes were fitted with 24 degree lenses on the bottom panel and 8 degrees on the top – the unit is customisable in this respect – which allowed a precise focus and the washing effect to cover the entire exposed rock face. The stage was approximately 600 metres in front of the rocks, separated by a large lake and a racecourse. The Robe fixtures were controlled via e:cue software running on a standard laptop, complete with full battery back-up at the control position. An e:cue excite dongle was plugged in to a WDMX indoor transmitter and fed to WDMX micro-transceivers fitted to each of the lights, which was the only practical way of sending data to the units given the physical layout and circumstances. The control station was located in a car parked beneath the rock, and a WDMX ‘ugly’ box was used to monitor the local frequencies. 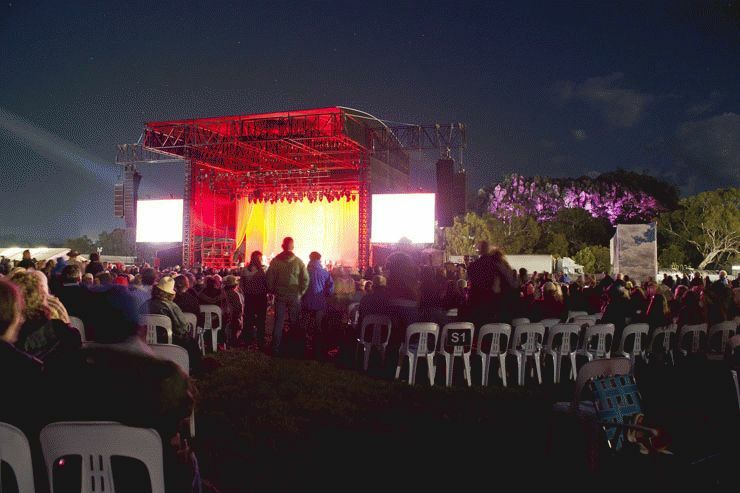 This was the first ever live concert event to be staged at Hanging Rock, and the idea of highlighting the natural surroundings proved a huge hit with the 15,000 public who attended and all the authorities. The dynamics of the lighting revealed an additional beauty that had never before been seen or appreciated before at Hanging Rock.